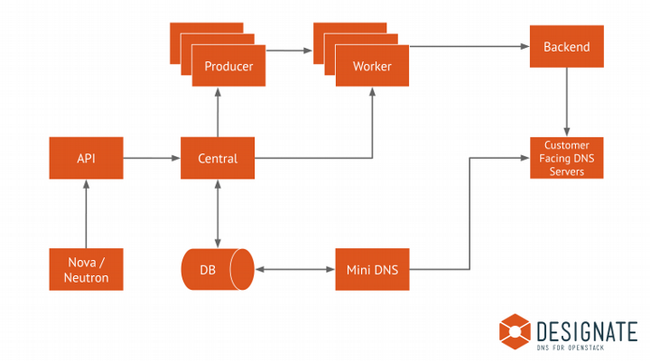 Learn how to install and configure Designate, a multi-tenant DNS-as-a-service (DNSaaS) for OpenStack. Designate is a multi-tenant DNS-as-a-service that includes a REST API for domain and record management, a framework for integration with Neutron, and integration support for Bind9. This article explains how to manually install and configure the latest release of Designate service on CentOS or Red Hat Enterprise Linux 7 (RHEL 7), but you can use the same configuration on other distributions. I have Ansible roles for bind and Designate that demonstrate the setup in my GitHub repository. This setup presumes bind service is external (even though you can install bind locally) on the OpenStack controller node. Note: Bind packages must be installed on the controller side for Remote Name Daemon Control (RNDC) to function properly. # (and all zones associated with it) and recreate it. # points to the public IP of the controller node. # List out the nameservers for this pool. These are the actual BIND servers. # We use these to verify changes have propagated to all nameservers. # request zone transfers (AXFRs) from. # This should be the IP of the controller node. # by running designate-mdns on them, and adding them here. # openstack zone create –email=admin@rhlab.dev rhlab.dev. Designate should now be installed and configured. I thought Designate uses different service/package for DNS.. finally it is bind.. Great Tutorial. Thank you Amjad..